King of the Ring 1993 was a seminal event in WWF and world history. The first King of the Ring pay-per-view, it featured a tournament won by an ascendent Bret Hart and a World Championship match between a descendent Hulk Hogan and challenger Yokozuna. This was a rematch of the infamous 30 second match they had at the end of Wrestlemania IX earlier in the year where Hogan won the title from 'Zuna after a misplaced Mr. Fuji salt throw into Yokozuna's eyes and a classic Hogan legdrop. It would be the last match of Hogan's WWF career and of his entire life as he died during the filming of Thunder in Paradise later that year. The following are haikus based the world championship match. 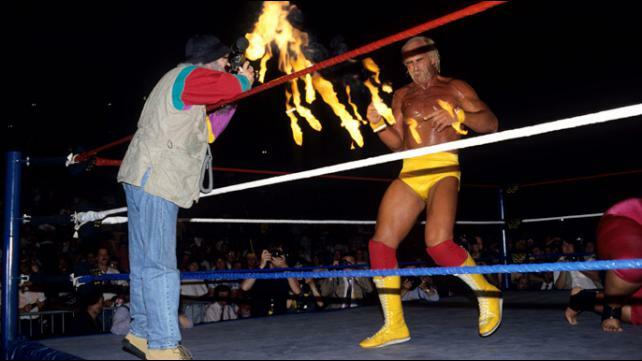 "The bright lights of the WWF are too much for the Hulkster."